Physicians should stop a course of antibiotics once the infection has cleared, instead of using an arbitrary number of days. I am constantly amazed at the standard practice of giving antibiotics for a predetermined number of days. We often prescribe a 7-day course or a 10-day course or a 14-day course. Sometimes, it’s just a 3-day course. Whatever it is, it seems that it has to be a relatively standard football score; an 8-day course simply won’t do. Over the years, I’ve tried to find out where these numbers come from. The best I can determine is that it comes from the process of antibiotic approval by the Food and Drug Administration. A prospective controlled study must be done to compare a new drug for a particular infection with a drug that already has FDA approval. However, instead of comparing which drug cures patients faster or more effectively, cure rates are sought after a predetermined number of days of treatment. I suspect that is because it would be almost impossible for the pharmaceutical company to determine study costs with an uncertain duration of treatment. So when the study is completed and the drug is approved, its publication becomes the reference for physicians to use. Unfortunately, the duration of treatment — that predefined and arbitrary number of days — is taken to be gospel, and physicians start using for their patient management, even though it was cooked up by some bean-counter in the pharmaceutical company. We have data to suggest a better way. 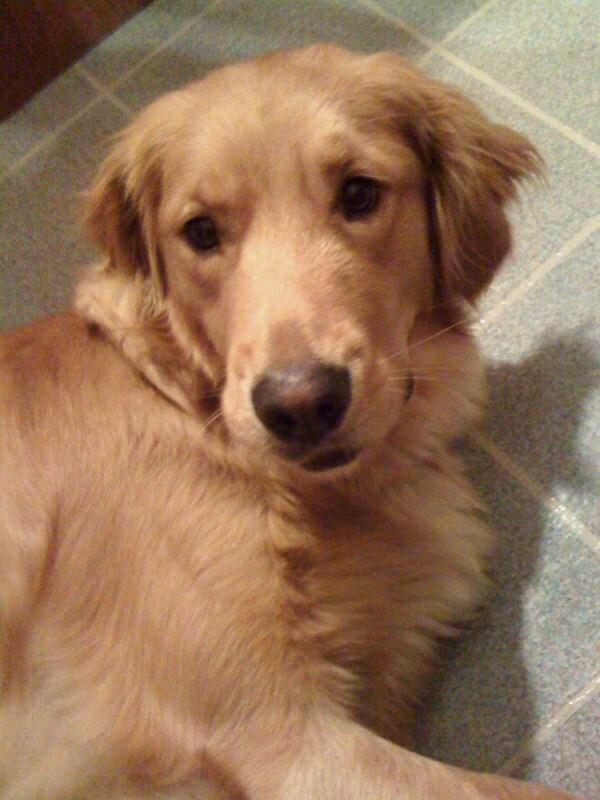 In a study analyzing 11 prospective controlled trials of antibiotic alternatives for the treatment of intra-abdominal infections, Dr. Harlan Stone demonstrated that the inflammatory signs (fever, elevated white blood cell count, presence of immature neutrophils) often used to identify the presence of an infection can also be used to identify its eradication. It is amazing to realize that it would be a paradigm shift in medicine for doctors to act like doctors and not obey the therapeutic recommendations of accountants. It will be a true paradigm shift in medicine when clinicians fully understand the biology of open wounds and their physiologic management. I’m often told by other health care workers that wounds must be kept moist to keep them from desiccating. When I challenge them to explain desiccation, I’m told that it means “drying out’ (which, of course I knew). However, I’m more interested about what is actually drying out. You see, I think that many clinicians believe that living cells in the exposed wound will dry up and die if left exposed, which is not accurate. What is known is that cells in culture, such as epithelial cells, need moisture to survive. However, the cells in an open wound are not the same as isolated cells growing in culture. The cells in the wound have a blood supply providing them nutrients that diffuse through the salt-based interstitial fluid bathing all cells. In fact, the serous fluid that normally leaks off an open wound is the manifestation that the wound is perfused and is spontaneously moist. Hence, they are not in jeopardy of drying out unless their blood supply gets cut off. Also, we know that open wounds that are otherwise left alone will dry out. However, what is drying out is a scab, or what we call an eschar. This consists primarily of coagulated protein from the plasma that has leaked to the wound surface. It is interesting that one of the original studies that formed the basis for moist dressings on wounds was actually misinterpreted. 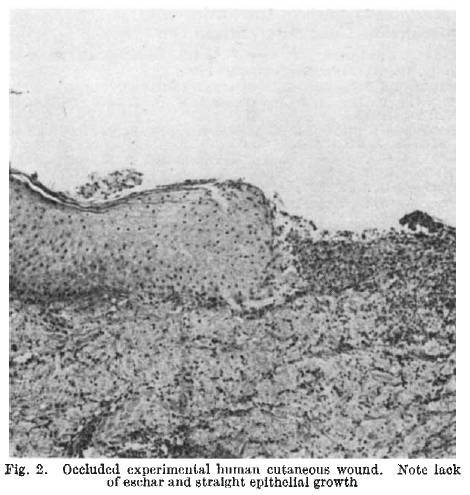 Hinman and Maibach published a study in Nature in 1963 in which they compared open versus closed management of split thickness skin wounds in volunteer humans. The open wounds on one arm were simply left exposed while the others were covered with sterile polyethylene film. The covered wounds healed much faster, lea ding them to conclude that the process of drying out impaired healing in the other wounds. However, the histology presented in the report reveals another story. 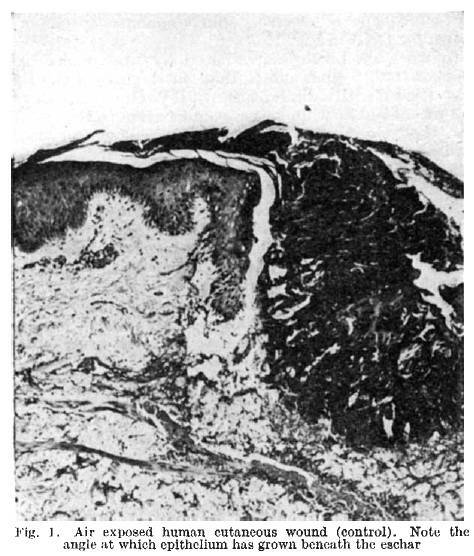 The epithelium had to regrow over a longer distance because of the presence of the scab in the open dried out wounds. Epithelial cells weren’t dying out from desiccation, but were actually trying to grow across the dermis to confluence. The scab actually prevented contracture that would otherwise occur to flatten out the wound and provide a short course for epithelial resurfacing. So the problem isn’t that the living tissue will dry out and die. The problem is that scab formation — which occurs more readily when the wound is dry — delays wound healing. A more direct approach would be to prevent the scab by frequent cleansing. In cases where the scab has developed, it is best to remove the scab, which can be done by cutting it away (i.e., surgical debridement) or by using a true wet-to-dry dressing. These actions leave the wound healing processes of contraction and epithelial resurfacing unimpeded. There is no benefit to prolonged courses of prophylactic antibiotics, and there are some serious things wrong with them. It is standard practice to give antibiotics prior to a surgical operation, especially those with a suspected or certain risk of bacterial contamination. It has been demonstrated that doing so will reduce the risk of a subsequent wound infection. Timing, dosing, and antibiotic selection are all critical in optimizing the outcome. The practice of giving antibiotics in this manner is called prophylaxis, because we expect it to prevent some of those infections. A critical concept behind prophylactic administration is that it is given to patients who currently have no evidence of an active infection. What has also been demonstrated is that there is absolutely no benefit to a prolonged course of prophylactic antibiotics. The concept underlying the practice is that antibiotics should be in the tissue at the time bacteria land in the tissue as a result of the skin incision. Once bacteria are no longer landing in tissue, further antibiotic use will be futile as those bacteria that are surviving are in some microscopic area where the antibiotics cannot get to them, such as a fluid collection or a hematoma or a piece of suture material or debris. continuing the current antibiotic regimen (not likely to work as the infection developed while on that regimen). However, if the patient has been off “prophylactic” antibiotics when (and if) signs of infection develop,cultures could then be obtained and presumptive antimicrobials can be started with reasonable expectations that the offending organism(s) will be covered. This practice would reduce costs and deter the emergence of resistance without increasing the rate of surgical infections. It would be a true paradigm shift in medicine to realize that knowing and doing works better than wishing and hoping. Shock is what happens when the energy supply to cells is inadequate for their demands. Unfortunately, shock is often equated with a reduction in blood pressure, but there are several mechanisms for reduction in blood pressure, and they don’t all result in decreases in the energy supply to cells. The above phenomena relate to the hydraulic properties of the circulation, characterized by pressures and flows. While in many cases, these conditions could be associated with a shock condition, but not necessarily so. For example, many individuals normally have a low blood pressure resulting from a low cardiac output and/or a vasodilated vascular bed. However, this circulation matches their metabolic demands. If metabolic demands are not met by the circulatory hydraulics, then shock is likely present or soon will be present. On some occasions, this is due to circulatory insufficiency, such as with hypovolemic or cardiogenic shock. But in other states, it may be due to excessive metabolic demands, such as during septic shock. Neurogenic “shock” is not on the list above because there is no problem with fuel supply that is impaired in neurogenic shock. Unless the individual tries to stand up, in which case the brain gets inadequate oxygen delivery because the heart doesn’t have the vascular tone in the lower extremities to prevent blood pooling. Of course, this is a self-correcting problem, because the decreased oxygen delivery to the brain causes them to pass out, fall down, and once again be level so that the brain’s blood flow is restored. It would be a true paradigm shift in medicine if these physiological principles were understood in managing critically ill patients. The Paradox: Cutting skin increases the chances for infection. Closing skin increases the chances for infection. The integument (i.e., the skin and the epithelium lining the digestive and urinary tracts) is our immune system. When the integument is injured, microorganisms have the opportunity to invade the interstitium. This invasion triggers a response by the so-called immune system, which really functions as a border patrol. Several of such invasions can be managed by the local defenses, which are various types of white blood cells resident in the tissues. For example, a paper cut on the finger is an opportunity for organisms to invade. Because the total number of organisms that actually invade in a paper cut are usually very meager when people are washing their hands frequently, the local defenses can handle the invasion without even demonstrating the signs of infection. When a higher concentration of bacteria get into the tissue, such as a cut with a dirty and highly contaminated knife, the number of organisms overwhelm the local defenses. As a result, a call for backup occurs, and white blood cells of various types are called into the fray, producing the typical signs of an inflammatory responses (redness, pain, swelling, warmth, etc.) which we recognize as an infection. When we surgeons incise skin, we enable the potential for bacterial invasion. If the amount of contamination is excessive, we will trap those organisms in tissue at the time we close the wound. In such cases, it has been demonstrated that timely administration of antibiotics immediately before and during the contamination will reduce the rate of surgical infections observed. Prolonged antibiotics following wound closure have been shown to offer no benefit, but rather increase costs and the potential for resistant strains to emerge. Despite extensive data regarding the necessarily brief course of antibiotic effectiveness as prophylaxis (and national initiatives promoting antibiotic discontinuation by 24 hours postoperatively), many clinicians still feel compelled to continue prophylactic perioperative antibiotics for days and days following surgery. The paradigm shift in medicine is to understand the biological nature of surgical wound infections and use antibiotics in a targeted strike against the invaders.